Incorporating offline items such as in-class exams or written assignments into your MyMathLab gradebook allow you to keep all of your grades in one convenient location. It also allows your students to know their current grade at any point in the semester – a “constant early-alert” if you will. In this article I’ll go over the process for entering grades for offline items into the MyMathLab Gradebook. By offline items, I’m referring to grades for pencil & paper exams, written homework, projects, etc. My three main areas of focus will be on creating an offline item in the gradebook, managing offline items (adding/changing scores), and changing weights for categories and individual assignments. OK, you’ve just given your first in-class exam and you want to post the results to MyMathLab. Why would you want to do that? For starters, that allows your students to see the results without having to wait until they are returned in class. Also, by tying your MyMathLab grades together with your in-class test grades your students can see their current grade at any time. To get started, click on the Control Panel in your MyMathLab course, and then select Gradebook from the MyMathLab area. Do not select Gradebook from the Assessment list – this is the Course Compass gradebook and is not tied to MyMathLab results. Once your gradebook opens, select “Add Offline Items” from the “More Gradebook Tools” drop down menu. 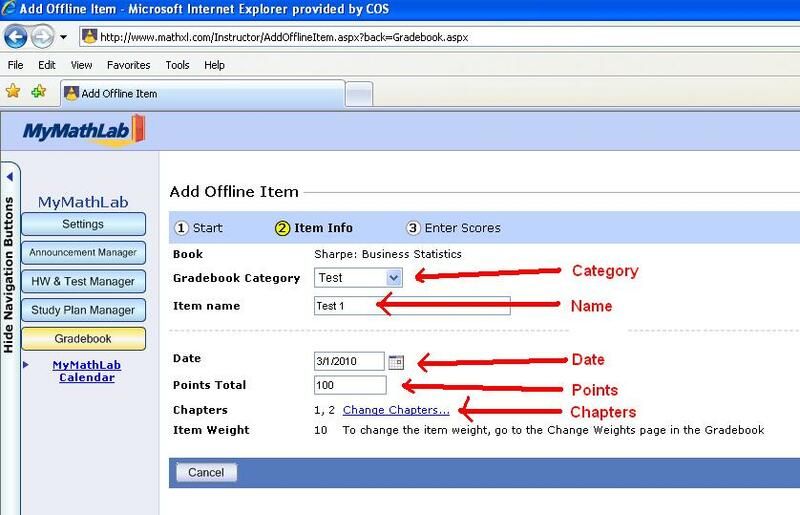 On the first step, leave “Add an offline item to any category in your gradebook.” selected and click on “Next”. In step 2 select a category (Homework/Quiz/Test/Other) for your offline item. Add a name, date, number of points possible, and even change the chapter to one associated with this item. Here is how the screen would look for a 100 point test on Chapters 1 & 2. Press “Next” to move to step 3. If you have already given and graded the offline item, you can type the scores here and click on save. Otherwise, leave the scores blank and click on save – you can come back later to enter the scores. To add scores or change item information, select “Manage Offline Items” from the “Other Gradebook Tools” drop down menu in your MyMathLab gradebook. You have a few choices at this point for each offline item. 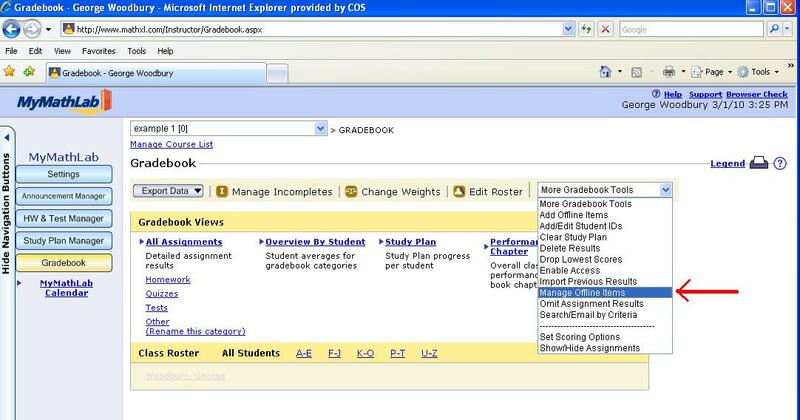 “Change Scores” allows you to enter or change student scores, starting on step 3 of the “Add Offline Items” process. “Edit Item Info” allows you to change information about the item, such as name, category, or date. It starts you on step 2 of the “Add Offline Items” process, and you can then change scores if you wish. “Delete” will delete the item and all of the scores. Be careful. MyMathLab has the following point defaults for category weights: Homework – 30 points, Quizzes – 20 points, Tests – 50 points, Other – 0 points, Study Plan – 0 points. 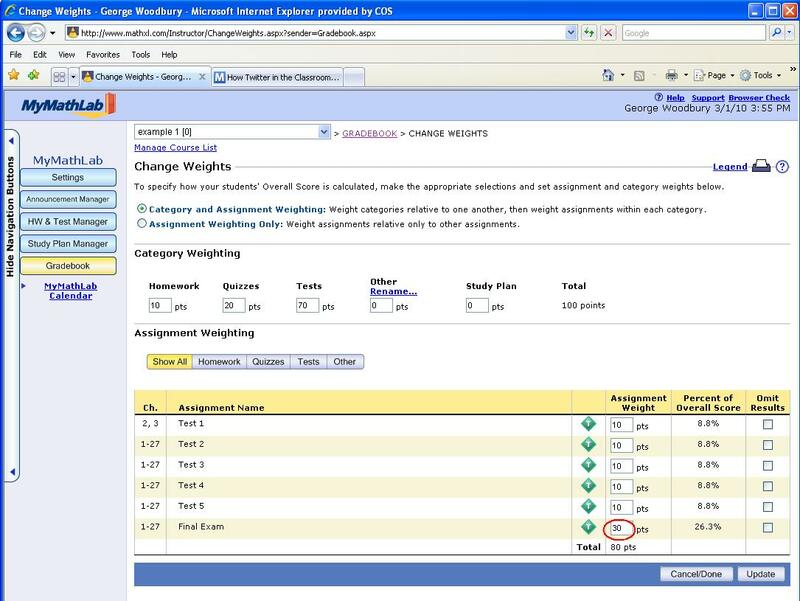 These can be adjusted by clicking on the “Change Weights” link in the MyMathLab gradebook. For example, if you wanted your homework to count for 10% of the grade, quizzes for 20%, and tests for 70% (5 exams, and a final that was worth 3 exams), you could begin by resetting the weights as shown. Be sure to click the Update button to save any changes to category weights. In the previous example I mentioned that I wanted the final exam to be weighted equivalent to 3 tests. MyMathLab defaults each item to 10 points, so I can change the final exam grade to 30 points to accomplish the proper weighting of each item. 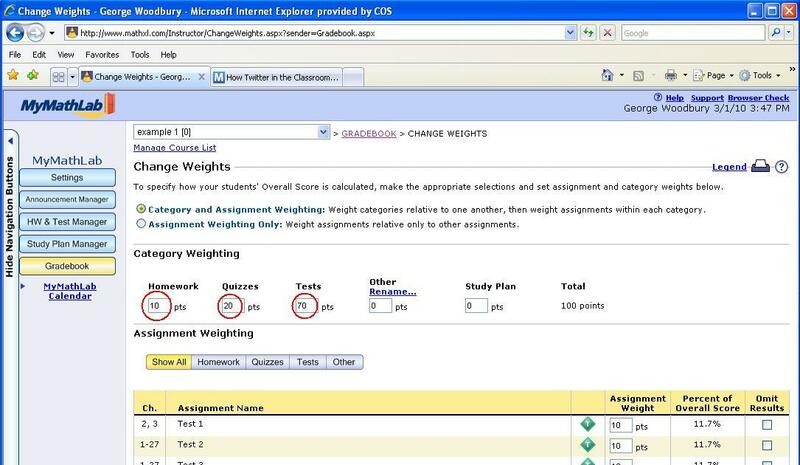 From the Change Weights screen, change the assignment weight for the final exam to 30 points as shown. Notice that the final exam is now worth 26.3% of the overall grade while each exam is worth 8.8%. They were all originally worth 11.7%. One note I should make – an exam weighted at 10 points is significantly different than a homework assignment weighted as 10 points. This is due to differences in category weights (70% for tests vs. 10% for homework) as well as the difference in the number of items in each category. Hopefully this article has helped you to understand incorporating offline items into your MyMathLab gradebook. If you have any questions on this, or any other MyMathLab gradebook question, please leave a comment or reach me through the contact page on my website – http://georgewoodbury.com. Entry filed under: Math, MyMathLab. Tags: add offline items, algebra, amatyc, developmental math, education, george woodbury, gradebook, ictcm, manage offline items, Math, my math lab, MyMathLab, mymathlab gradebook, NADE, Pearson Education, prealgebra, statistics, stats, teaching, woodbury.